FILE - U.S. President Donald Trump shakes hands with North Korea leader Kim Jong Un at the Capella resort on Sentosa Island in Singapore, June 12, 2018. The Singapore summit ended Tuesday with the United States and North Korea committing to denuclearization of the Korean Peninsula. But the seemingly biggest headline does not even appear in the official signed summit agreement, with President Donald Trump repeatedly expressing his commitment to halt what he called joint military "war games" between the U.S. and ally South Korea. "We are going to get out of the war games that cost so much money, because I think, number one, it's very provocative, and I want to deliver. And I think they're very happy about it because it is so provocative. But it costs a fortune to do it, and we won't do that as long as we're negotiating in good faith," Trump told VOA contributor Greta Van Susteren after the summit. Trump's decision has left allies and the U.S. service members on the peninsula needing further clarification, while drawing mixed reaction from military experts. South Korea seemed caught off guard by the decision, with a presidential Blue House spokesman saying, "We need to find out the precise meaning or intentions of President Trump's remarks." "This may have been a unilateral decision by the president," Kyle Ferrier of the Korea Economic Institute of America told VOA on Tuesday. U.S. Forces Korea spokesman Army Colonel Chad Carroll said he had "received no updated guidance on the execution or secession of training, to include the summer/fall's scheduled Ulchi Freedom Guardian." "In coordination with our ROK partners, we will continue with our current military posture until we receive updated guidance from the Department of Defense and/or Indo-Pacific Command," he added. Later in the day, Defense Department spokesman Dana White said Secretary James Mattis was "not surprised" by the call to halt military exercise on the peninsula and was "fully aligned with the president." Many were shocked when Trump criticized the U.S.-South Korea exercises as "provocative," the same word that adversaries China and North Korea have used to describe them, rather than calling them "defensive" in nature. "[That's] not something that any American president, I think, has ever done," Ferrier, who criticized the summit's outcomes, told VOA Tuesday. "I would wish that he hadn't have used [the word 'provocative'], because it is the same language that's used by our adversaries," Army Lieutenant Colonel (retired) Daniel Davis, who supported the summit results, told VOA. In Singapore, Trump Says He will Halt US-S. Korea "War Games"
​Some in the Washington saw Trump's decision to halt the exercises as a setback, with The Washington Post editorial board calling the summit a "triumph" for North Korea. "If you look back earlier this year, Kim Jong Un had made a statement, essentially stating that he understood the validity, the legal validity, the need to hold these exercises," Ferrier told VOA. "A few months later, President Trump is saying, 'Well, no, we're getting rid of these exercises' … without really much action on the North Korean side." Davis, of the conservative think tank Defense Priorities, disagreed, hailing the choice as a bold first step toward the ultimate goal of denuclearization. "It's just a pause, it's not a concession. We're literally giving nothing. We're simply not taking action here while continuing to train and we have our capabilities that are not diminished. But if that can lead to a diminishing of threat, and lead eventually to a peace treaty, that's definitely something that's in America's interests," he told VOA. FILE - U.S. and South Korean army soldiers pose on a floating bridge on the Hantan river during a joint military exercise against a possible attack from North Korea, in Yeoncheon, South Korea, Dec. 10, 2015. 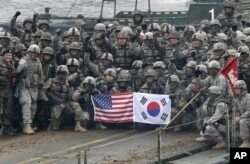 There are 28,500 American troops in South Korea, but only a small fraction, about 3,500 of them, make up the single U.S. combat brigade on the peninsula. Davis suggests Trump could go so far as to make the potential transfer of these troops a "negotiating chip" in further talks. "What's the purpose of those troops at all? It's to protect us. But if removing those troops can be a component of protecting us even to a greater degree, then that's something we should give serious consideration to," he said. For now, however, any change to U.S. troop numbers on the peninsula remains off the negotiating table as Trump looks to Kim to provide verifiable steps toward denuclearization. Secretary of Defense Mattis told reporters at the Pentagon ahead of the summit that "the U.S. and South Korea are not engaged … in any reduction of U.S. forces talks," adding that U.S. troop levels in South Korea "is not something that other countries would have, I would just say, initial domain over a discussion with us."